DALLAS – Less than two months after opening for the mega concert of Fall Out Boy and Panic! 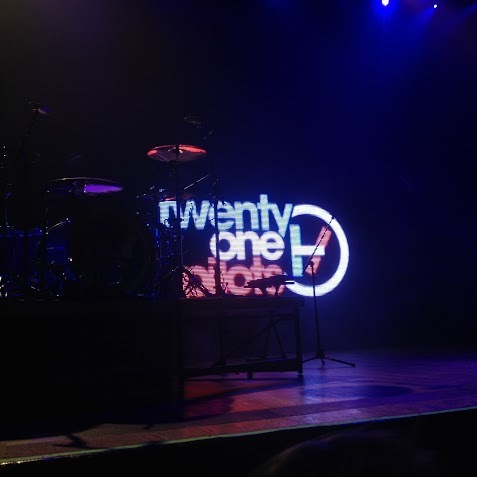 at the Disco, Tyler Joseph and Joshua Dunn of Twenty One Pilots returned to Texas on their own tour with opening acts Sirah and Robert DeLong. The three extremely talented artists seemed to be ecstatic to perform for the crowd of almost 1,600 people on the brisk evening of Nov. 14. Fans began to line up earlier than 5 p.m., for the doors opened at 7 p.m. and no one wanted to risk the chance of getting a bad spot in the cozy venue of the House of Blues. 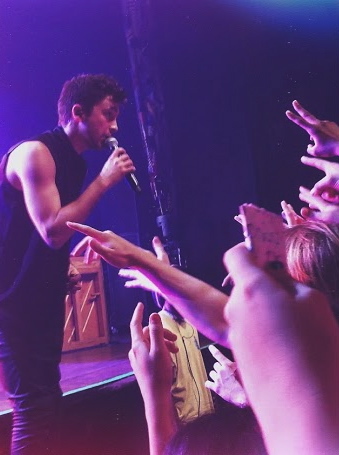 Tyler Joseph gets up close and personal with the crowd as he sings “Migraine”. The lights dropped and a snippet of “Trees” began to play. The lights flashed on, and there Joseph and Dunn assumed their positions to sing the opening song “Fake You Out”. Joseph and Dunn played over 15 songs including “Migraine”, “Ode to Sleep, “Car Radio” and “Addict with a Pen”. During a drumming duo (which is included in each Twenty One Pilots performance), Joseph and Dunn came out into the crowd, but in a very unexpected way. Two wooden platforms were placed on top of the raised hands in the crowd. Joseph and Dunn got on top of the platforms and played the drums while being suspended in a sea of hands. It was truly amazing, I had never been to a concert that exceeded the spectrum of creativity like Twenty One Pilots did. The thing about Joseph and Dunn’s music is that it touches you on a completely different emotional level. Their music is not just empty words. There are hidden meanings and analogies which have to be decoded by the person listening. You can tell from their lyrics that they love music an incredible amount and that they have a burning passion to create music that is far more complex than the typical song with repeating stanzas. It is quite evident that the fans of Twenty One Pilots would go until the ends of the Earth just to please Joseph and Dunn. You will often see the duo wearing ski masks or their signature skeleton jackets as they perform. When a concert comes around, fans will also wear ski masks and paint their faces to resemble skeletons in order to match Joseph and Dunn’s on stage appearance. The first opening act was Sirah, a bold female rapper from Long Island, NY. Her performance really involved the crowd by conversing with them in between songs and asking them to sing with her for many audience members did not know the lyrics to her songs. Sirah’s more common songs include “Survival”, “Up and Down” and “When I’m Gone”. Robert DeLong, the second opening act, is a solo artist who is classified as electronic with a hint of dubstep. DeLong sang many songs including “Global Concepts”, “Basically I” and “Just Movements”. DeLong creates all of his music by controlling Wii and Xbox remotes to produce different sounds along with lyrical aspects. He uses a loop petal to layer his voice in order to make it sound as if there are multiple voices singing throughout his songs. His essence of dubstep was great for pumping up the crowd before Twenty One Pilots came on stage. Joseph and Dunn were definitely brought into this world to set the standards high for the way artists perform and change the normality of music. Their creativity, love for their fans and ability to perform is exactly what the world of music needs, but best of all the passion they have for producing genuine music makes this duo one of the best in the world.